Baltic Amber Teething Necklace, You cant be serious! Baltic Amber Teething Necklace - you can't be serious! Every day we get many notes from our valued customers asking about Baltic Amber Teething Necklace. Here are a few of them! So What is Baltic Amber Teething Necklace? 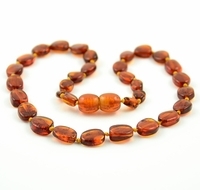 Comprised of Baltic Amber Beads Amber Necklace are designed to be worn by children when they are teething. What is the magic in Amber Necklace handmade of Baltic Amber Beads. Baltic Amber has some of the highest concentrations of Succinic Acid found in nature, and this is what makes it so special. Even though Baltic Amber is categorized with gemstones and crystals, it is something else entirely. It is really a Fossilized Resin that was formed over 45 million years ago. Scientists and researchers have always been fascinated with natural Amber and among their many findings, concluded that natural amber achieved a ''solid state'' and endurance over time because of oxidation. One of the unique properties of Amber (and probably the most prolific) is that it warms to the touch when you hold it in your hand or when it is worn against the skin, transmitting a very relaxing feeling. The use of Baltic Amber Teething Necklace is also an ages-old tradition in many parts of the world and is fast becoming the most popular, ''natura'' remedy for teething children. Baltic Amber performs its wonderous healing without being rubbed on the gums or swallowed or any such intrusive method. It simply has to be worn and in contact with the skin for it to provide the full benefit of pain relief. And because Baltic Amber is a gentle, natural remedy, it is totally safe, non toxic, and has no side effects whatsoever. So what makes Amber so unique and incredibly effective? It possesses one of the highest concentrations of Succinic Acid that can be found in nature. It is the active ''ingredien'' in the composite of plant and animal tissue that have come together within the fossilized resin. It is the primary driver of such profound and beneficial effects on the human body in its ability to heal and eliminate pain. The highest content of the acid is found in the Baltic Amber Cortex - the external layer of the stone. Nobel prize winner Robert Koch, (1886), the pioneer of modern bacteriology, proved that Succinic Acid has a very positive influence on the human body. Are you dealing with a teething child? Wondering when either of you will get a good night's sleep? Wishing you could make the pain stop even for a few precious minutes? Perhaps it's time for you to turn to the most natural teething pain remedy of all a Baltic Amber Teething Necklace. And then you will experience for yourself why discerning parents everywhere would never be without it! Learn more about Baltic Amber Teething Necklaces. Disclaimer: The material provided on amberartisans.com is for information and educational purposes only and is not a substitute for medical treatment or diagnosis.